The movie poster for “The Possession”; if you want to scare your girl, bring her to this movie. aka The Exorcist for both this generation and the Jews. Did that opening statement interest you? Well if it did, then good, because this movie was awesome! I was freaking out! 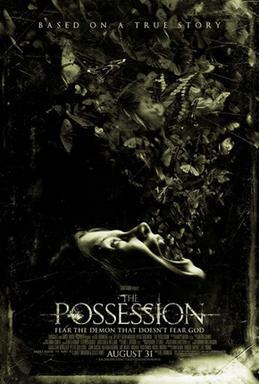 Based on a true story (there’s a book out there that explains that true story, and I’m trying to get my hands on it), The Possession chronicles a family’s troubles as the youngest in the family buys a box from a yard sale, unaware that the box contains a dybbuk, a type of demon or spirit from Jewish folklore. The movie featured among its cast Jeffrey Dean Morgan trying to be a good dad after divorcing his wife, played by Kyra Sedgewick, Natasha Callis as the possessed little girl (and who might have a good career going for her, if you ask me), and Hasidic rapper Matisyahu as an exorcist named Tzadok (and yes, there are Jewish rappers; including this guy, there are three professionals I know of). The film was very well done in my opinion, with the little girl Em showing both some Exorcist, some The Ring, and even some Grudge in her performance. The effects were simple but very effective, with wind, flashing lights, and a roomful of moths among what was used. And in the end when you actually see the dybbuk, you can’t help but be grossed out by it; it’s disgusting to behold. The script was also well-written, though reminiscent of The Exorcist in that at first the possession is considered a reaction to the divorce, followed by a medical/psychological problem, and only afterwards, with a little too much grace, is the supernatural acknowledged. However, even though the plot was done, it found new life here. Not to mention that the end left room for a possible sequel. Oh, and Matisyahu’s character made a joke at some point that has a distinctly Jewish flavor to it. For the possession, I give The Possession a 4.8 out of 5 for being utterly freaky, the actors convincing me with their emotion, and some very nice special effects. Points were taken off, because like I said, the acceptance of the supernatural was just too rapid for me, or at least there was less reluctance to accept it than I thought there would be. The Possession was very creepy at parts, particularly when it came to the girl changing her voice. What’s even creepier is the fact that the storage area where the movie props were being held was found burning after they filmed. I watched it with a few of my Dish coworkers, and there were quite a few jumpy moments. I plan on seeing it again soon, so I’ve added it to my Blockbuster @Home queue so I won’t have to worry about paying for another movie ticket. I’ll have some time to look for other scary movies too! yeah, i heard about the warehouse. being a guy open to the supernatural, i cannot think that that was a coincidence. makes me almost want to get my hands on the real Dybbuk Box.